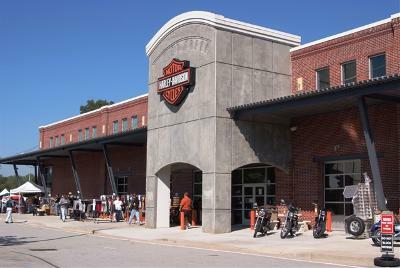 Killer Creek Harley-Davidson® opened for business in north metro Atlanta in the city of Roswell, Georgia in September 1999. Our 30,000+ square foot building was modeled after one of Harley-Davidson® original factory buildings located at 3700 W. Juneau Avenue in Milwaukee. The water tower and roll-up doors are a prominent feature on both the original building and our dealership. We are very proud of our architects, Randall Paulson, from Roswell and their attention to detail to recreate this retro-style building for our customers. When you visit our dealership, the first thing you will see is our service department. This is no coincidence. Our commitment is to provide Atlanta area bikers with the best service in the South. This is what separates us from the pack. We have nine full-service bays each with 2 lifts, a full detail bay, a dynometer, and a full-service machine shop including boring bar, honing machine, hydraulic press, bead blaster, a milling machine and a full line of specialty tools. In addition to our large shop, we have a 6700 square foot indoor storage area to ensure your motorcycle stays indoors, safe, and dry when not on a technicianals lift. Our technicians are factory-trained and are continually upgrading their knowledge through factory-sponsored education programs as new products and technology develop. They have a commitment to render you their finest work. Please come visit our service advisors today. The area known today as north Fulton County was a wild and dangerous place in the late 1700s and early 1800s. The hills, valleys and streams were controlled by the Cherokee Indians. A prominent warrior named Nankeeteehee, a Cherokee war title which literally means "Four Killer", lived at the head of the stream which bears his name. Four Killer was not only a name, but a rank. As a warrior vanquishing one enemy after another, his designation and importance rose. White settlers slurred Four Killer's name to "Foe Killer", the name now used to designate the creek which flows for several miles from west of Alpharetta, south into Big Creek. This proud Cherokee suffered the same fate as many other Native Americans. Four Killer's land was taken from him in the land lottery of 1832 and he died on The Trail of Tears to the Oklahoma Territory in 1838. Killer Creek Harley-Davidson® is conveniently located near the areas of Atlanta, Sandy Springs, Douglasville and Lawrenceville.